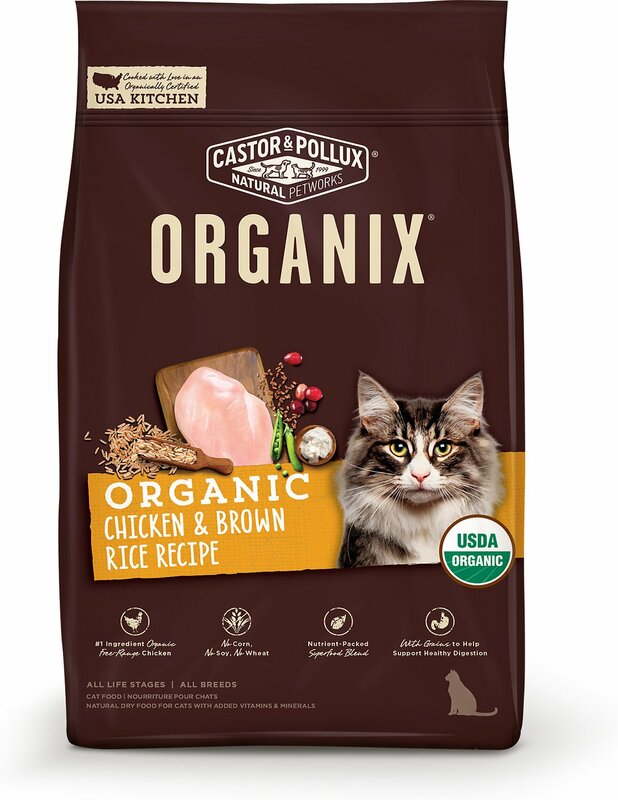 Give your pal the superfood-packed nutrition he needs with the Castor & Pollux Organix Chicken & Brown Rice Recipe Dry Cat Food. It’s formulated with organic, free-range chicken as the first ingredient plus organic pea protein, oatmeal, and brown rice. Specially blended with superfoods like coconut oil, cranberries, and flaxseeds, it packs a dose of goodness in every bite. Because it’s loaded with wholesome grains, it helps support healthy digestion and sensitive tummies. 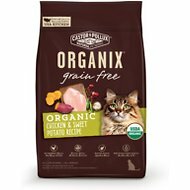 It provides a complete and balanced diet for kitties of all ages, and is cooked in organically certified, USDA accredited kitchens right here in the USA. You can feel good about feeding your pal since it has no soy, corn, gluten, chemical pesticides, synthetic fertilizers, antibiotics, growth hormones, artificial flavors, colors or preservatives. Made with organic, free-range chicken as the first ingredient, plus organic pea protein, oatmeal, and brown rice. With special blend of nutrition-boosting superfoods including flaxseeds, cranberries, and coconut oil. Formula contains whole grains like brown rice and barley to support healthy digestion and sensitive tummies. Provides a complete diet for cats of all ages with lean protein, vitamins, minerals, omega-3 and 6 fatty acids, taurine plus probiotics. Cooked in USDA-accredited organically certified USA kitchens, with no soy, corn, chemicals, fertilizers, antibiotics, hormones, artificial flavors, colors, or preservatives. Organic Chicken, Organic Chicken Meal, Organic Pea Protein, Organic Oatmeal, Organic Peas, Organic Brown Rice, Organic Barley, Organic Sunflower Seed Meal, Organic Coconut Oil, Organic Chicken Fat (preserved with mixed tocopherols), Natural Flavor, Organic Flaxseed, Organic Chicken Liver, Organic Dried Alfalfa Meal, Salt, Choline Chloride, Salmon Oil, Vitamins (Vitamin E Supplement, Niacin Supplement, Thiamine Mononitrate, d-Calcium Pantothenate, Vitamin A Supplement, Pyridoxine Hydrochloride, Riboflavin Supplement, Vitamin D3 Supplement, Biotin, Vitamin B12 Supplement, Folic Acid), Minerals (Zinc Amino Acid Complex, Iron Amino Acid Complex, Copper Amino Acid Complex, Manganese Amino Acid Complex, Sodium Selenite, Calcium Iodate), Taurine, Organic Cranberries, Potassium Chloride, Rosemary Extract, Dried Bacillus Coagulans Fermentation Product. Using the chart, divide the total per day by the total number of times you feed your cat per day to determine the portion size for each meal. Use the information below as an initial recommendation only and adjust when needed. Kittens and pregnant or nursing females may consume 2 - 3 times the recommended amount; allow access to dry food at all times. Keep a clean bowl of fresh water available at all times. Help your cat maintain good body condition by monitoring food intake, providing exercise and visiting your veterinarian on a regular basis. Feed daily. Portions are based on a standard 8 oz measuring cup. Add approximately 1/4 cup for every 2 lbs of body weight over 15 lbs. To help your cat adjust to a new diet, we recommend slowly introducing Organix by mixing it in with the current food over the course of 7 - 10 days. Gradually increase the amount of Organix while decreasing the amount of your cat's current diet. We have six cats and have been looking for a quality food for them. This is ideal! The larger size kibble helps keep my gobbling cat from eating too fast. All the kitties seem to eat it readily. The ingredients are the best we have found and the larger bag is an added bonus. Great product! This is the best cat (dry) that we have ever given our cats. This combined with some organic wet food has kept our cats healthy for years. When we switched to this brand we saw noticable improvement in the coat, weight loss and improved activity level. Suddenly, pea protein is everywhere. Must be cheap or something. But most of my cats will not eat anything with pea protein in it, no matter the brand. I once had a chocolate shake made with pea protein, and I must say that was one weird drink. Imagine chocolate with a lingering legume aftertaste. If the cat food tastes like the shake, I don't blame them for walking away. No more pea protein in this household! It's a waste of money. Healthy organic dry food, cats go for it the way most people go for chips! We have seven cats, and they were on the sweet potato formula for a long time but some lost slight interest, so I gradually switched them to the brown rice. This formula doesn't seem to be as tough for them to crunch (some have had teeth pulled, etc.) and when we soak some dry food to add to the Organix wet food, the brown rice is a lot easier to mash up once it's been soaked. It's nice to have two different flavors to bounce back and forth between. My cat loves this food ! But, I did my research, and this company is owned by a pharmaceutical company, and I'm not willing to feed my cat food made by people thar have no clue what is good for animals ! I returned my last order without even opening the package ! Please do your research before purchasing food for your fur babies...there are a lot of products out there that are made by companies that know nothing about pet health. I'll stick with Vital Essentials instead. I like it more than my Scootie did. He wouldn't even try it.